Improving energy efficiency is a critical factor in most industrial and process automation applications. Managing harmonics and the power factor within a power system will improve its efficiency and result in significant energy savings. One method of managing power factor has been to use capacitors to encourage current flow, rather than to impede it. However, capacitors can be prone to premature failure caused by higher voltages across the dielectric of the capacitor. Therefore, it is better to consider an alternative option. Another factor to take into consideration is managing peak loads to reduce electricity demand charges. Utilities charge fees for the available demand that they must have readily available to handle peaks in the load, which a business’s operations may place on the utility. Even if that peak demand is only present for a matter of minutes. A simple method of managing peak loads is to use simple on/off controllers to ensure that the peak demand caused by motors starting up, or heating elements coming on is staggered. However, for some applications, especially those that utilise thermal electrical elements, they fail to maximise the efficiency of the power consumed. A thyristor, or a silicon-controlled rectifier (SCR) is a device that has been specifically designed to manage the power within a system, in order to maximise energy efficiency and the productivity of a process. Eurotherm has many years' experience specialising in the control of power systems and ADM Instrument Engineering carries the most common Eurotherm thyristors in stock. So, how exactly does a Eurotherm thyristor help you improve the efficiency of your power system and reduce your electricity demand charges? 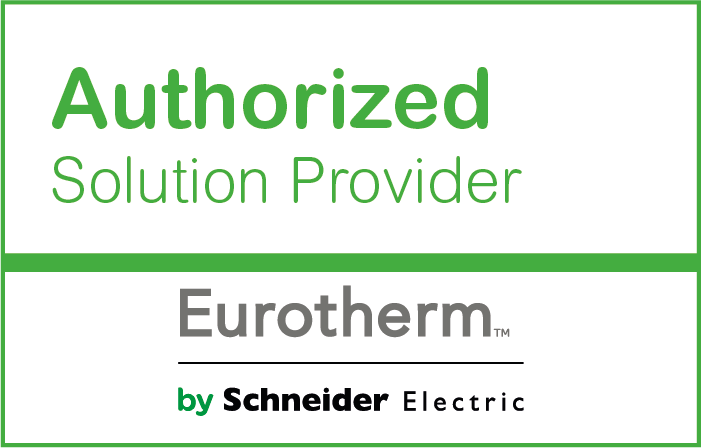 Unlike simple on / off heating controls, which give you very little control over the power supplied to the element, Eurotherm’s thyristors allow you to carefully the control heating process so that you maximise on energy savings. The simple on / off controller only has a ‘hard’ switch on. 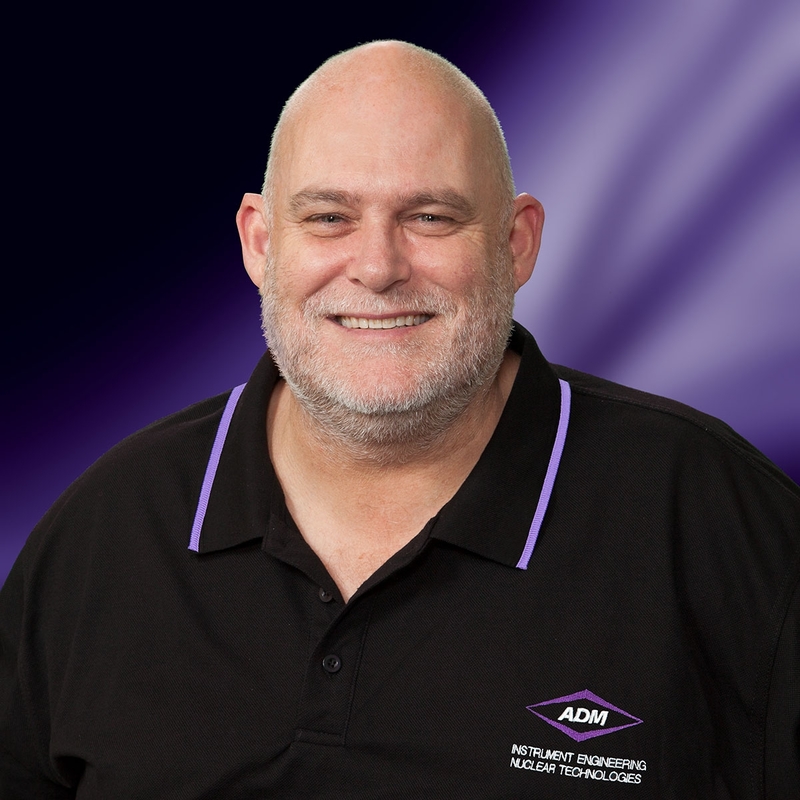 There is no opportunity to manage the peak demands you may have in your power system. The Eurotherm EPack & EPower thyristors allow you to control the ramp up of the current, allowing you to bring it up gradually, controlling the load in the system. This also has the added advantage of increasing the lifetime of the heating element. With inductive loads, most circuits will have some internal resistance. This causes the current to lag the voltage, adversely affecting the system’s power factor. A ‘Phase Shift’ is when the voltage and current no longer fall and rise together. The transformer firing capability of the Eurotherm EPack & Epower thyristors compensate for the phase shift ensuring accurate control of the heating element. It also allows optimal power factor to be maintained. Not all thyristors are equal. Traditionally, if you had a 40A load you would have needed to select a 50A thyristor. 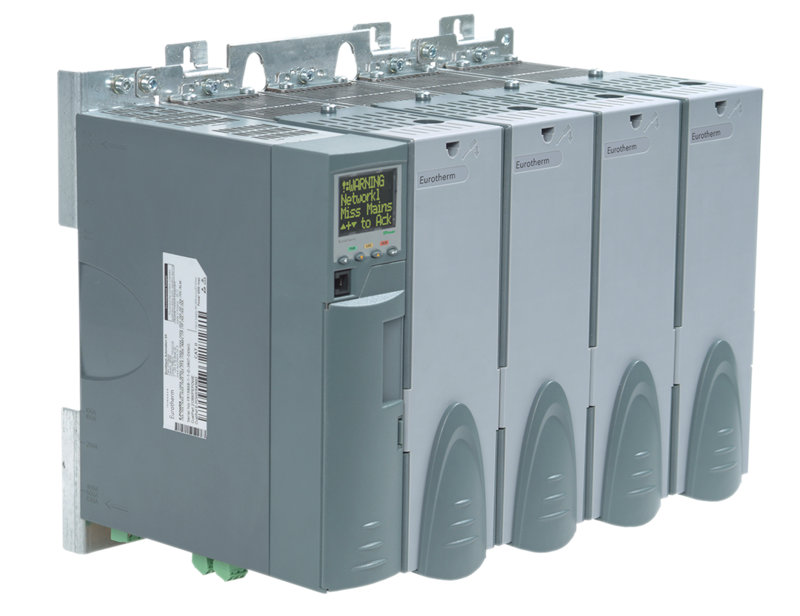 With the Eurotherm EPack & Epower series you can calibrate the current output to the actual load required, improving the efficiency of the system. The Eurotherm EPack & Epower thyristors operate as a slave to a PLC, controlling the current supplied to the elements precisely. Thus, achieving the power level requested by the PLC by adjusting the current, voltage, or true power necessary to ensure that the heating element maintains the exact required temperature. 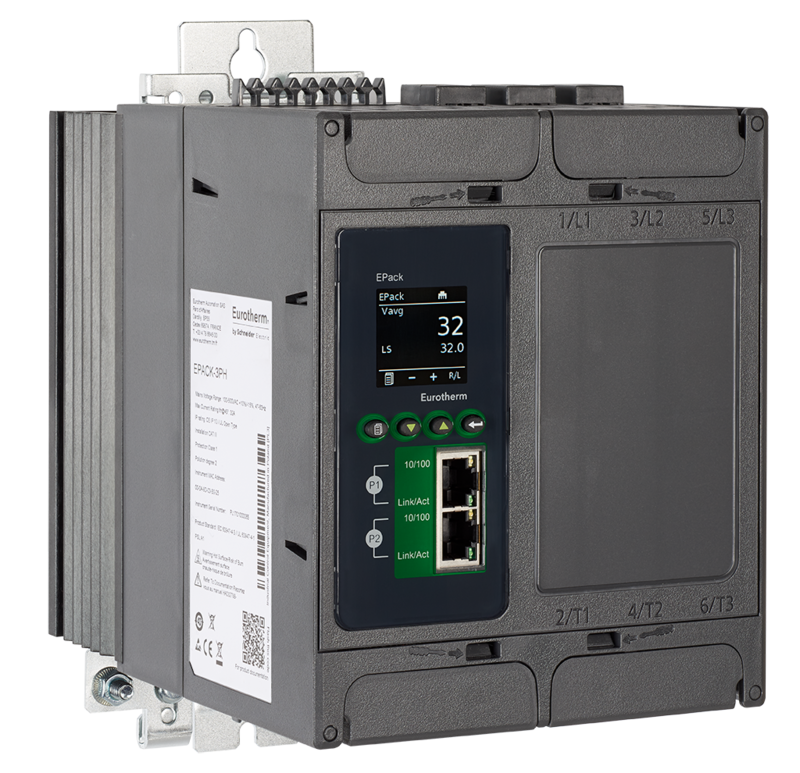 For truly excellent PID control a PLC would us a Eurotherm controller such as the EPC2000 as a co-processor. The precision is such that there is virtually no overshoot of the set point. This means energy is not wasted by providing more heat than is required. Another useful side effect is the minimisation of scrappage due to damage caused to materials through overheating. Another useful feature you will find on the Eurotherm EPower is the built-in Load Tap Changer. This can manage the multiple stages of a transformer, switching them on and off to ensure that the inductive output of the thyristor remains between 80 ~ 100%. Thus maintaining a healthy power factor. This is particularly useful for when you have no other choice but to use phase angle control. If you have a single phase set up, powering an electric thermal heating element you may want to initially start off with an output voltage of 240V for the cold start. Once the temperature has started to build, you may want to switch over to a lower voltage tap, say 110V to keep the thyristor’s inductive output between 80~100%. At a later stage in the heating cycle you may need to drop the voltage again. For example, down to 60V to keep the thyristor’s output in the optimum 80~100% output range. The Lod Tap Changer makes this a fairly simple process and saves you money by maintaining a power factor as close to zero as possible. The Eurotherm EPower series of thyristors incorporate a very useful feature: Predictive Load Management. Load balancing distributes the power of different loads equally to obtain an overall power consumption as stable and balanced as possible. This eliminates peaks of power, helping to reduce electricity demand charges. Each heating zone controlled by an EPower is defined by an output power, cycle time and a maximum power (max capacity), which can be pictured as a rectangle. Rather than letting these rectangles pile up randomly, the Predictive Load Management uniformly distributes them. Thereby ensuring that at any given moment the overall power is as stable and balanced as possible. It is important to understand that the PLM function does not change the output power but rather balances and shifts the power evenly, eliminating any disturbance. The result is optimum load management through intelligent load balancing and load sharing, a strategy that will eliminate peaks and flicker, and even out the overall power usage. The load shedding function allows limiting and shifting the overall energy consumption all together, or with fully adjustable user-defined priorities. Adjustments can be made through fieldbus communication (Profibus, DeviceNet and Ethernet) enabling dynamic adjustments in view of current ON peak period surcharges. Predictive Load Management can also be used to offer operational redundancy using its inherent peer to peer functionality between heating stations. This is achieved by prioritising the most important heating elements used within your production process. For example, on a float glass line in the lehr would get preference over heaters on coating lines. The lehr is critical to keep glass flowing during production. If this loses power, there could be significant scrappage. If you would like further information on how a Eurotherm thyristor could improve your energy efficiency and production costs, then do not hesitate to contact ADM on 1300 236 467. Christopher Lonergan, our Eurotherm Sale Leader has more than 30 years' experience working with the Eurotherm product range. He will gladly answer any questions that you may have.